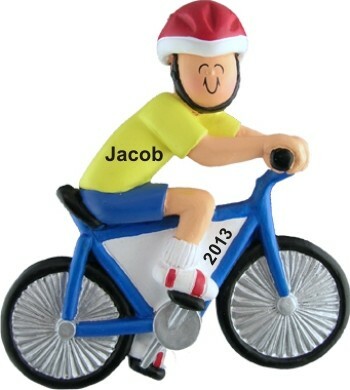 Celebrate a love of riding the road or the trail with the bicycle male personalized Christmas ornament in handsome style and color. A display cord is attached for hanging these hobby ornaments personalized from Russell Rhodes wherever they're enjoyed the most. We'll hand letter a name and the year on the male bicyclist personalized Christmas ornament and ship it your way in our classic velvet gift bag. gift Nov 27, 2016 Suzanne C.